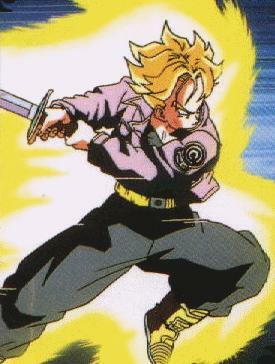 Trunks is the son of Vegeta and Bulma and is Goten's best friend. He is a hybrid between a saiyan and a human, making him very strong. He becomes a super-saiyan at an early age. He first appears when Frieza comes to Earth after the Garlic Jr. saga. He comes from the future, and much to the suprise of the Z team, quickly turns super-saiyan and defeats Frieza and Frieza's father, King Cold. He tells of super-strong androids coming to Earth to do about what every bad-guy does, DESTROY! Later, Bulma and Vegeta marry and have two children, Trunks, and Trunks little sister, Bra.